Recently a series of patients with Prolactinomas (a pituitary prolactin – secreting tumor in brain) was published. They found they often presented with either one sided migraines (often orbital) or SUNCT (short-lasting unilateral neuralgiform headache attacks with conjunctival injection and tearing). They felt prolactin levels should be done in those with with trigeminal autonomic cephalalgias like SUNCT. Cabergoline, a dopamine agonist, worked well. 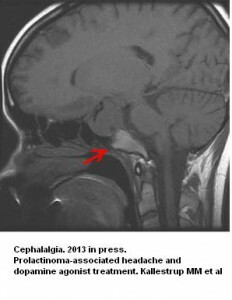 Prolactinoma-associated headache and dopamine agonist treatment. Kallestrup MM, Kasch H, Osterby T, Nielsen E, Jensen TS, Jørgensen JO. all received cabergoline except one who got quinagolide.